As with any home and garden product, there are several suppliers to choose from when buying artificial grass. Make sure you get the best quality grass and more turf for your money by reading this buyers guide. Ask for free samples in the post. Ask what guarantee is provided (typically 5 years). Consider asking if a supply-only service is available (for DIY garden experts). When making a price comparison, use the square-metre cost. Enquire about delivery charges as this can be hundreds of pounds. Good realism in comparison to natural grass. A holed latex backing for drainage. A high grass blade density. Ask to see a portfolio of recent lawn installations. Look for evidence of corporate examples, as this guarantees the supplier’s team has experience. Consider visiting an open garden or showroom (if available). Ask what infill is available; good suppliers offer sand, rubber or superior non-infill surfaces. Ask if there are any additional costs for groundwork, levelling and preparation. Ask for a price break-down (cost of artificial grass and cost of installation service). Artificial grass rolls are glued down in strips so check the seams of your lawn are hidden. The edges or your lawn should be consistent and flush against any borders so check for gaps. Ask for any problems to be rectified the same day. The look and feel you most prefer. The manufacturing complexity and different materials used for artificial grass products are evident by simply looking at the above photographs. Clearly we can expect a significant price difference between the entry level and superior artificial grass lawns but there are occasions where an economy lawn would be the best choice. Typically half the price of a premium artificial grass lawn. Excellent for garden games as the bounce and roll of a ball is far better on this compact grass. Best choice for high traffic areas (such as dog runs) as the grass is less likely to deform. Ideal flooring surface for home driveways (indeed you can park on artificial grass). It is easier to clean the artificial grass due to having a more rigid surface. Softer than economy grass – most modern artificial grass products are coated with silicone. Sufficiently advanced to look real from a distance. Long pile heights of more than 30mm per blade of grass makes this a child friendly surface. Often looks real from only a short distance. If your garden has an uneven surface or poor sub-base, you can save time and money on your lawn installation by padding the grass. This will provide stability, comfort and safety without the need for extensive groundwork. Additional safety flooring is available from most suppliers for creating a child friendly environment around garden trampolines or climbing frames. Such padded underlay can meet critical fall heights of up to three metres and can be applied to most artificial grass products. 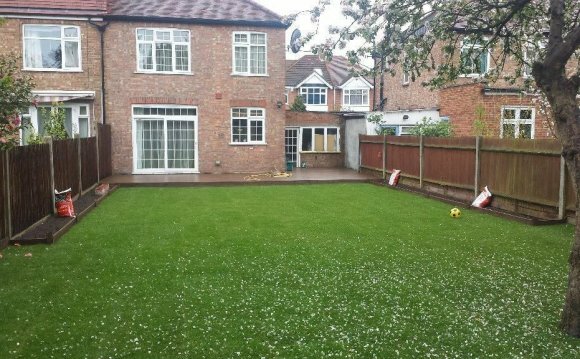 Once you have selected which artificial grass product best suits your requirements then it’s time to buy. Keep in mind that buying online is often cheaper than over the telephone and some suppliers even use eBay and similar websites to sell discounted off-cuts (a small or irregular piece of artificial grass). Remember to ask for a complete price list with range of samples and you will be confident in selecting the best artificial grass for your garden. This article was written by A G Thompson. All artificial grass photographs are courtesy of As Good As Grass.